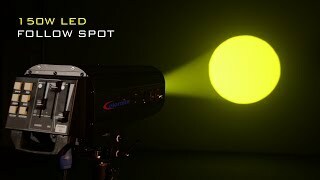 The Colornite F150 LED follow spot is a compact follow spot for small venues with throw distance of 15-20 meters. It measures 535mm long and weighs 10.2Kg only. F150 incorporates motorised color wheel, dimmer and iris onto is rear control panel for ease of use. The F150 features manual zoom between 8-15°. Zoom and focusing knob are both located on right side of the body making adjusting of beam angle on the fly a simple task.